Android Users 80% More Valuable to Advertisers than iPhone Users? In the Android vs. iPhone war for mobile supremacy, which operating system should advertisers look to target? 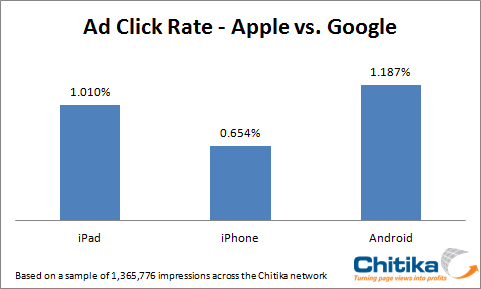 Online ad network Chitika looked at ad click rates across its network for the two devices and came to the conclusion that Android users are by far more valuable individually than iPhone users – people on the Android OS clicked on ads 81% more often than people on the iPhone. So what exactly does that mean? Are Android users less intelligent than i*hone users which would lead to them being suckered into tapping on mobile ads? Or are Android users simply too new to the smartphone world that they are unfamiliar with ads leading them to random tappings? What’s the deal? All I know, is that activations of Android devices are increasing by the minute and we’ll leave that as the reason why our family is making advertisers so rich. Anyone Receive the FRG22D Update for their DROID?